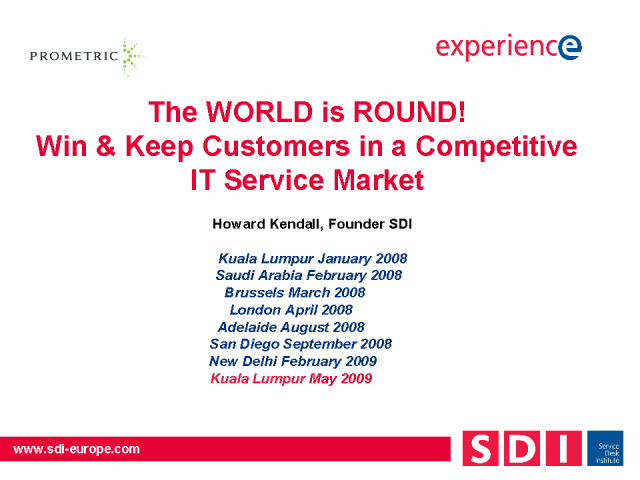 Keeping Customers Close in a Competitive Global IT Service Market - Yes that's YOU too! In ITSM - and iTIL v3 - we talk about getting closer to our business customers. What does that really mean in practice? And what can you do to get some quick wins? Understanding the customer business & culture - and their pains to address. Today's world has the most demanding customers ever. However the lessons of Jan Carlzon's 'Moments of Truth' book still apply. Getting underneath our customer's requirements to truly learn their business 'pains' in their own culture and environment is difficult to do, but it can be done. This will provide you with lasting benefits, and a truly loyal expanding customer base. The people & skills you must have to compete and survive. In some western countries we've stopped trying to keep our skills up to date - and we're losing competitiveness as a result. In other countries - Asian countries in particular, people are so hungry to learn they choose all sorts of learning to boost their job and promotion prospects. I'm sure I know what are both the right skills to succeed in today's economy, and the type of people behaviours and attitudes you need! And they are there in all of us, some of us show them more than others but how do we get those skills used most effectively for our personal and business success? Which standards, processes & technology will help - and what won't. There are a whole lot of processes, standards, infrastructures, SAAS, virtual and dedicated software and tools out there. Many of these are pursued hungrily by advocates and followers. But which really make a difference? What should YOUR priorities be? How do you get the maximum return at the lowest cost?